Au·gus·tin·i·an [àwg? 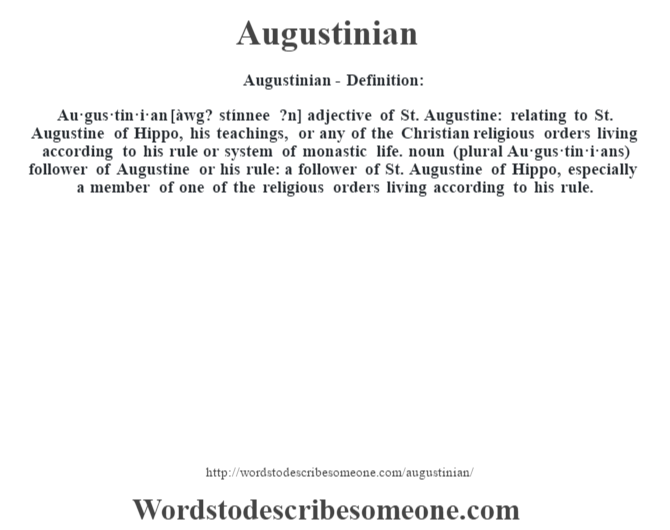 stínnee ?n] adjective of St. Augustine: relating to St. Augustine of Hippo, his teachings, or any of the Christian religious orders living according to his rule or system of monastic life. noun (plural Au·gus·tin·i·ans) follower of Augustine or his rule: a follower of St. Augustine of Hippo, especially a member of one of the religious orders living according to his rule.